No, I’m not dead. Neither is my blog. I’ll be back with a passion unlike anything you’ve seen before. But, prior to that, I have to un-busy myself and thin down my schedule. Ha. Like that’s possible. Those who know me or those who have become familiar with me through my blog or other work surely know about my journey with the Boy Scouts of America. Despite being dismissed from Scouting at age 14, after acknowledging my sexual orientation, I still believe that the Boy Scouts offer young men a program of education that will last for life. Just as the national and professional local leadership have misguided the organization into anti-gay turf, the organization is now under scrutiny for decisions by some of the very same folks for what might very well be illegal and/or harmful timber logging practices on up to 34,000 or more acres of American forests, according to a Hearst Newspapers investigation. I find it unfortunate — perhaps maddening — that the BSA, Inc. leadership has chosen this most un-environmentally friendly approach to business. But I find it almost as unfortunate that Hearst Newspapers decided to take such a negative tone, inappropriately (although probably without intent) casting blame for the logging on all scouts. Throughout the article, Hearst writers chose to say “the scouts” did this, or “the scouts” did that. There is a difference between Boy Scouts, the kids you see attending the camps and their parents, and professional “Scouters” who manage the money of The Boy Scouts of America, Inc. Hearst would have done well to remember that. Happy Thanksgiving everyone! It’s so wonderful to be able to take one special day out of each year to think long and hard about the people, places and things for which we are truly thankful. So many times in the world you hear people use the words “thank you” as a sort of involuntary, instinctive reply to someone else. Today we should use those words wisely and with ultimate meaning. 1. The love of my God. 2. The love and closeness of my family, no matter how far a part we might be. 3. Employment – basic needs are taken care of in my home. 4. My readers and supporters at Q-Notes and InterstateQ. QNotes has a brief story up now, with video from CNN and a poll. Expect a longer, feature article in the July 26, 2008 issue. The WRAL story. Helms worked here as a journalist and conservative commentator before moving to do his dirty deeds on the Senate floor. We need your help to stop anti-LGBT bullying! The anti-bullying bill moved forward in committee this morning, and tomorrow (Wednesday) afternoon, the full House will hold an important vote on this bill. Your Representative needs to hear from you right away about this bill. Click here to send an email now. It’s a bit technical, but morning a House committee helped advance the School Violence Prevention Act by voting to recommend that the House not concur with the weakened Senate version of the bill. We need the full House to support this motion not to concur so a conference committee can restore important language to the bill. Equality NC is fighting hard to pass this bill with the important language that ensures LGBT students are fully protected. This morning our interns and volunteers delivered more than 3000 postcards from constituents across the state to members of the House, demonstrating the broad support for this legislation. With our coalition partners, we’re lobbying hard to get it through. Hundreds of supporters have already contacted their legislators, but they’re hearing from lots of folks on the other side as well. Oh, my poor little InterstateQ. I’ve been neglectful, I know. Busy, busy days at work as we head into the Pride Charlotte festival on July 26, 2008. Our meeting tonight (or last night if you’re going to be reading this Friday morning) marks/ed the one month to go point. There’s no turning back now. But since I’m being so neglectful here, I’m sure ya’ll be happy to know I’m now on Twitter. Easier and quicker to update. Keep up with me there. 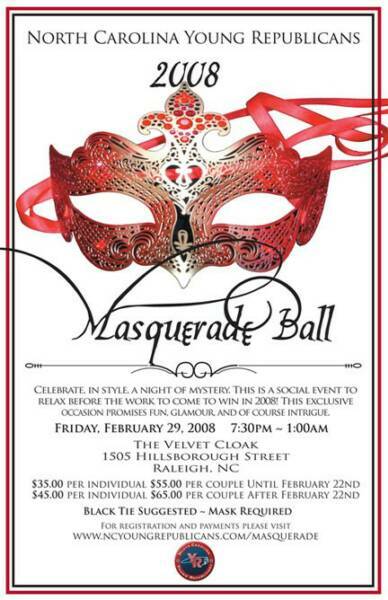 The N.C. Federation of Young Republicans will be holding a Masquerade Ball! That sounds so fabulous! I knew I should have switched parties; I’ve always liked finely dressed and wealthy guys anyway. Hey… where’s the Democratic Party’s masquerade ball? Oh well… I guess the HRC Carolinas Gala will have to do. Mike Metzger writes a great article about the need for “contrarian leaders” in churches these days; prophets you might call them.Â The Point tipped me off to the article which briefly highlights my own alma mater and our esteemed president: USC and Steven B. Sample.Â I never took Sample’s leadership course but I heard only great things about it. Our businesses, communities, schools, and churches need a few good leaders these days.Â Senators who will do what is right without looking for kickbacks, activists who lobby for causes not their own, business which do what is right because it is right, not because they must, pastors who seek God not advancement or growth. I always find it interesting that I find inspiration from many of the same sources as bloggers at The Point.Â It is all too common to devalue gay and transgender community members and I’m excited to have seen in my own life modern-day prophets who stand up and say: “God loves and affirms God’s gay and transgender children, just as they are!”Â Individuals such as my YoungLife leader Stef Shaeffer, Rev Dr. (and Pepperdine alum) Paul Egerston, civil rights leader Rev Phil Lawson, and others who “prick the conscience” and as Point commenter Paul says “afflict the comfortable.”Â Though they go against the grain in churches today, they stand for what is right regardless. Just a little update on InterstateQmobile. A couple weeks ago I was able to enable mobile browsing for InterstateQ.com. On any smart-phone (such as a Blackberry or iPhone) you can easily access a no-frills version of InterstateQ.com – a mobile version that focuses entirely on easy access to content. Since then, InterstateQmobile has actually been used (to my surprise!). It is getting about one read per day (not counting my reads). Someone… somewhere… out there in the universe… is reading InterstateQ.com content on their smart-phone, on the go. One read per day isn’t much at all, in fact… it is pretty darn close to zero, but it makes me feel good that at least one person is benefiting from it.